First Rockwool slab (size: 2400x1200x100mm, 1800x1200x100mm) will be slit into Rockwool strip (thickness: 50/75/100/125/150/200/250mm), then through conveying, swerving, and overturning system, its fiber direction will be upright in order to increase sandwich panel strength, finally after edge milling and PU spraying, Rockwool strip will be laminated with coil sheet and feeds to double belt system. 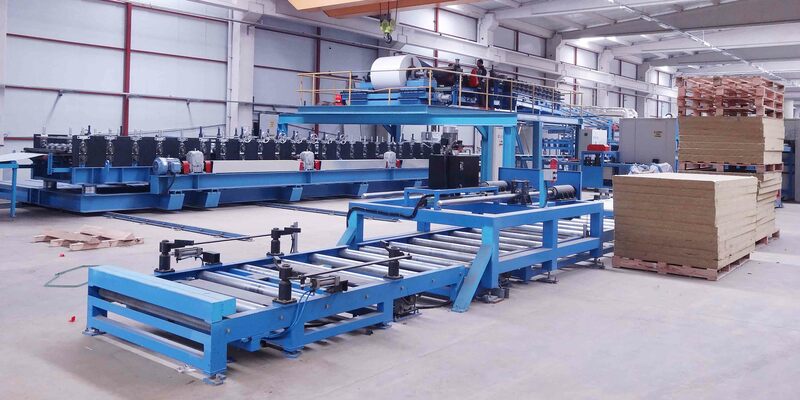 It can be separated used on Rockwool sandwich panel production line, or combined with PU + Rockwool sandwich panel production line. Rockwool sandwich panel connecting edge can be sealed with PU foam in order to increase its strength and insulation property.